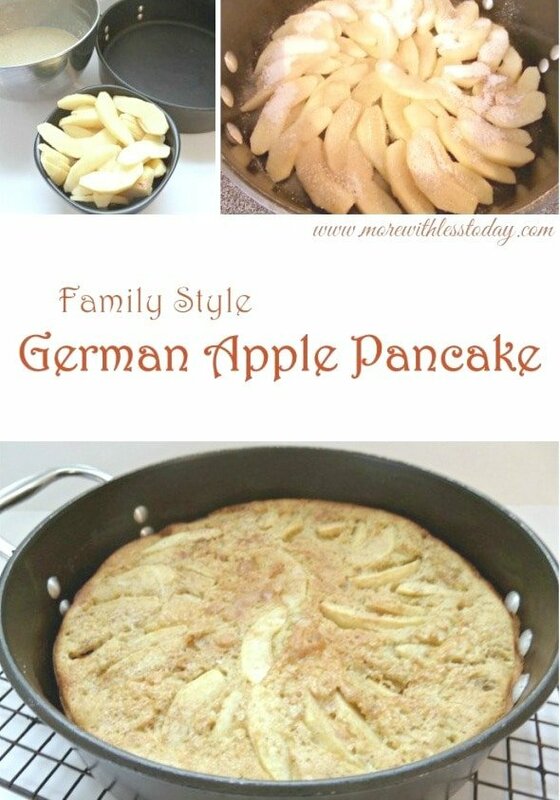 Family Style German Apple Pancake Recipe - New Breakfast Idea! Family Style German Apple Pancake Recipe – New Breakfast or Brunch Idea! We love to have a big breakfast on the weekend. Whether you’re cooking for a big family or if you want to have leftovers, this Family Style German Apple Pancake is always a hit. Mix the flour, baking powder, sugar, salt, and nutmeg in a medium bowl. Add milk and butter to the whisked eggs and combine well. Stir egg mixture into flour mixture and let stand for 30 minutes. While the batter is resting, coat the bottom of a large skillet with cooking spray or olive oil. Combine 1/4 cup of sugar, cinnamon, and nutmeg. Sprinkle over the bottom and sides of the skillet. 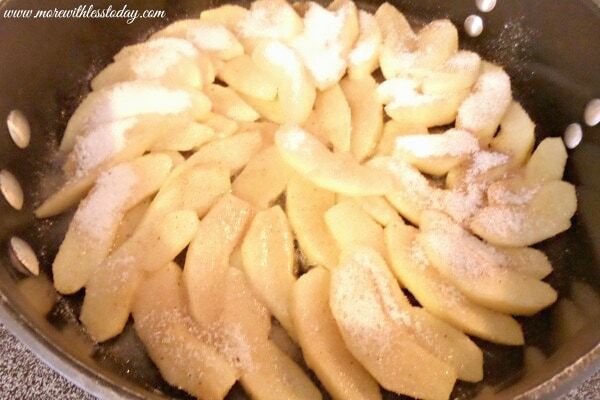 Lay apple slices evenly in the bottom of the skillet, arranging in a spiral. Sprinkle remaining sugar over top of the apples. Cook over medium heat for 8-10 minutes – do not stir. Slowly pour batter over cooked apples. Transfer the skillet to the preheated oven and bake for 15 minutes before reducing the heat to 375 degrees. Bake an additional 13-15 minutes. Remove from oven and loosen the edges with a spatula. The whole pancake will easily slide out onto a serving plate. Cut into wedges and serve. This is great with syrup or sprinkled with powdered sugar on top. The German Apple Pancake is also delicious served with bacon and hash browns or other breakfast or brunch favorites.